As told to Mike Yorkey – 227 pgs. In this world you’re surrounded by sexual images that open the door to temptation. They’re everywhere-on TV, billboards, magazines, music, the internet-and so easy to access that it sometimes feels impossible to escape their clutches. Yet God expects his children to be sexually pure. So how can you survive the relentless battle against temptation? Here’s powerful ammunition. 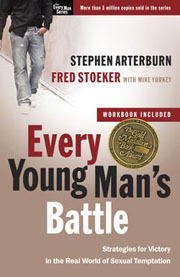 Steve Arterburn and Fred Stoeker, the authors of the hard-hitting best-seller Every Man’s Battle, now focus on the temptations young single Christian men like you face every day-and they offer workable, biblical strategies for achieving sexual purity.